I love being creative, it is one of my favorite outlets besides running. Whenever I get the chance to combine both, I’m in my ‘element’. 🙂 There are many different creative ways to preserve your running memories and moments. My favorite method is scrapbooks/smashbooks. I started making running books back in 2014 and I have done one every year since and I’ve started one for Love Bug. It’s fun to look back at the book once it’s all done to see your progress, your accomplishments and to remember the fun experiences. I like to try to fit all my races for a calendar year in one book, sometimes I cut it pretty close! 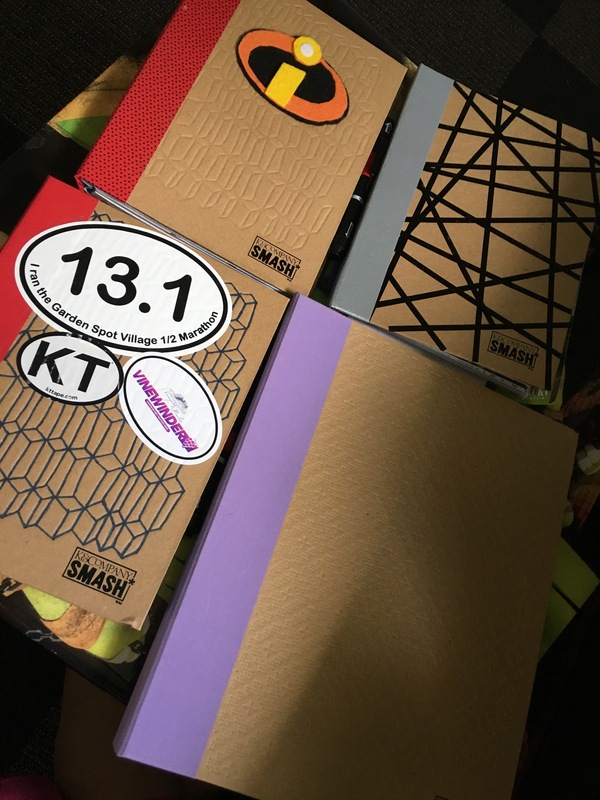 My preferred method is to use a SMASH book by K&Company. You can find them at your local Michael’s store, at Target, or online. I like them because they come with a pen that has a glue stick on the end, cool huh?! The pages are already “decorated” with different designs and patterns, as well as photo sleeves and pockets for extra things that may not fit on the pages. They are also different sizes. I have a large one that measures 13.5″ x 11″ and then the smaller ones are about 10.25″ x 8″. I definitely prefer the bigger ones, but I tend to find the small ones more often. I usually will glue in things like my race bib, pictures from the day any brochures or cute stickers I got in my goodie bag from the race. I also like to always put the date, my finish time, and if I can get it, my place overall and in my age group. I enjoy looking back through the last couple years of races and seeing how my times have improved…or not, cause that happens sometimes! I like to use my different colored sharpies as well as fun washi tape for some added embellishments.